Recently I baked a cake for the birthday of a very sweet gentleman I had just met. It was really funny the way I got to know that it was his birthday that day, but once the birthday was revealed we had to do something. And what better to do than baking a cake? It was last weekend when we were at Tijara Organic Farm, among fresh produce and lovely birds. We spent the weekend eating local cuisine cooked with the farm fresh organic ingredients while shooting pictures of the beautiful property lovingly constructed by Sneh Yadav and Tara Rao. And it was Tara's birthday that day. I decided to bake a cake that resonated with the principles Tijara Organic Farm lives by. We went through what was there in the pantry and decided to do a ragi cake with orange and carrots, everything fresh from the farm, ragi flour had come from the organic farmers in Rajasthan. Then I realised I had to work without an oven to bake the cake. I used to bake a cake in pressure cooker long back, but the pressure cooker available there was too small. We did a lot of improvisations and decided to bake the cake in a ceramic pot with lid. For such baking one has to fill up the base pot with sand and then heat it up on gas stove, then the cake tin is kept over the sand and covered. In case of pressure cooker the lid is fixed without the pressure vent. Here is how we placed the cake (in a borosil dish) inside the ceramic dish for baking. Also, while mixing the cake batter that day I kept adding the ingredients by approximate spoonfuls and Sneh asked me whether I do this way always. I actually used to bake so much cakes earlier that the eyeballing method never failed me. I started weighing the ingredients only after I started writing the recipes for you all to follow. My instagram and facebook shares of the birthday cake brought in some requests for the recipe of this gluten free ragi cake. So after coming back home, I made the cake again, weighing everything so the recipe can be shared. This time I topped the cake with loads of chopped walnuts, the way we like it. Mix the dry ingredients in a large bowl. The ragi flour, the baking powder and the salt and sieve together or just whisk to mix well. Grind the unrefined sugar with orange zest in coffee grinder or mixie jar. Now mix the wet ingredients. Add the eggs, ghee and sugar orange zest mix together and whisk till creamy and smooth. Pour the wet mix to the dry ingredients bowl. Mix lightly while adding the grated carrots. The mixture will be quite thick and resist mixing. Add orange juice to ease out the batter but do not make it flowing consistency. It should be barely flowing. Now grease a 7"X7" baking pan and pour the batter into it. Sprinkle the chopped walnuts and press using your fingers lightly to make them embed nicely. Bake at preheated oven at 180C for 40 minutes or till the center becomes firm, check with a skewer if in doubt. Cool and cut the cake in squares. This ragi orange and carrot cake fills your home with a pleasant aroma while it is baking. It is difficult to resist but the wait to cool down the cake will be well worth. This cake has a delicate crumb just like the ragi ginger honey cake I have shared few years ago. If you cut the cake when still warm it crumbs a lot but when you cut in after cooling down it behaves well. Ragi orange carrot cake makes nice breakfast cake with milk and may be a banana or eggs. If you are baking it for a birthday you can dress it up with some orange chocolate ganache. Or may be some orange buttercream. The birthday boy (Tara Rao) for whom I baked the cake that day is diabetic and I had baked the cake with lesser sugar. The ragi, ghee and carrots in the cake ensure the cake remains low glycemic even if it is lightly sweetened with sugar. So diabetics can have a decent sized serving of this cake too. I know many diabetics who wouldn't eat any desserts because they are denied and whenever they find a change they binge upon mithais and unhealthy cakes from the market. Baking such cakes for them more sense than making them crave for sugary stuff and giving in to temptations. Tara messaged me that he loved the cake and finished the leftovers with his coffee the next day. Sneh said this was the best cake she has had. I know it was a sweet complement from a friend but Arvind loves it too. I myself liked it when I tasted a small piece but personally I wouldn't be able to have it for breakfast like Arvind. I like my savoury breakfasts better. This ragi orange carrot cake will be useful for those who want gluten free options and of course for those who want to watch their weight while enjoying a few pieces of cake sometimes. Do let me know if you try this cake recipe. It always feels great to hear feedback from you all. I will share a pressure cooker cake soon. I know some of you were waiting for that too but I couldn't manage to do that. 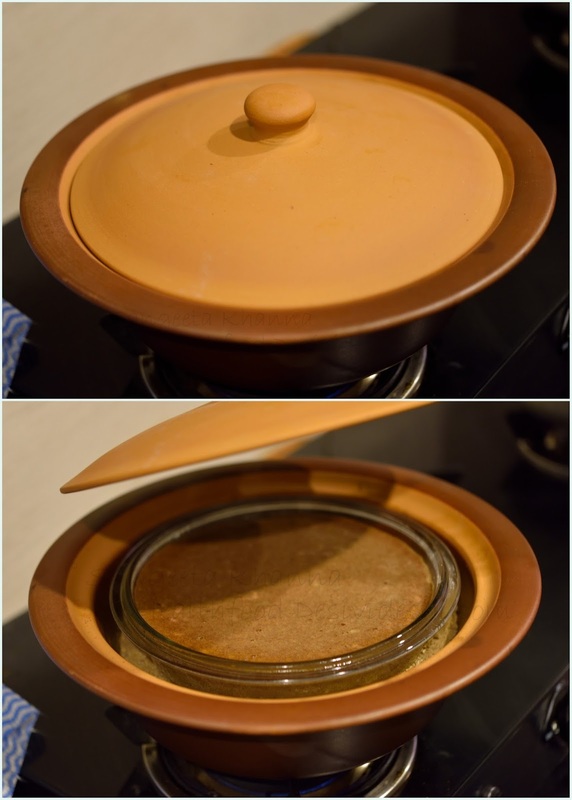 A pressure cooker cake needs either a short video or a step by step pictures to understand the process better. Please not this cake doesn't behave like any white flour cakes but the taste is great. The texture is also very different from regular flour cakes but great nonetheless. Take care of reheating the cake slices before serving (in microwave, or any other method that you may apply) as the cake tastes best when warm. The cakes slices better when cold but tastes good when warm. Small inconveniences that can be overcome when you bake gluten free cakes. This ragi orange carrot cake won't disappoint you trust me. One of my cousin used to make pressure cooker cakes and we used to do all her bidding. What ever she said, we did that day..just to be able to have a bigger peice of cake. I have to try this ragi cake soon. I know in older days small towns has very unpredictable electricity supply. We had to accommodate and of course innovate to bake :-) Do let me know whenever you bake this ragi orange carrot cake. Thanks for the recipe, is worth trying. Any color guide to check doneness, as the batter would be pretty dark i guess? Baking times also vary oven to oven. Unfortunately the dark colour of ragi makes it difficult to judge by the colour of the cake but if you have an idea of your oven there shouldn't be a problem. The skewer test can be helpful when in doubt. Ashna I think you can replace the eggs with yogurt in this case (about 90 gm yogurt for an egg, 270 gm for this cake recipe). Also please add about 3/4 tsp soda bi carb to the recipe so the cake becomes fluffy. Let me know whenever you bake. I will try and bake egg less ragi cake and share whenever possible.